But it’s not just me that thinks this way. Tesla’s forthcoming autonomous cars will be nothing more than an artificial intelligence machine on wheels. Tesla is building its own “AI computer”, complete with Tesla-specific microprocessors (silicon), to power its autonomous vehicles (see “Tesla Earnings Bombshell Reminds Us That Tesla's a Tech Company” for more details). And Google is creating the foundation for smart products with its new Edge TPU; a tiny AI accelerator that will carry out machine learning jobs “at the edge” of IoT (see “Google unveils tiny new AI chips for on-device machine learning” for more details). The technology is advancing at a pace that should enable any company to create “smart” products, things and spaces. But how does one go about actually creating smart? How does one decide where and how to integrate the growing power of machine learning, deep learning and artificial intelligence capabilities to power these smart products? Here’s my three step recipe for “Getting Smart” (with images of Maxwell Smart dancing in my head). 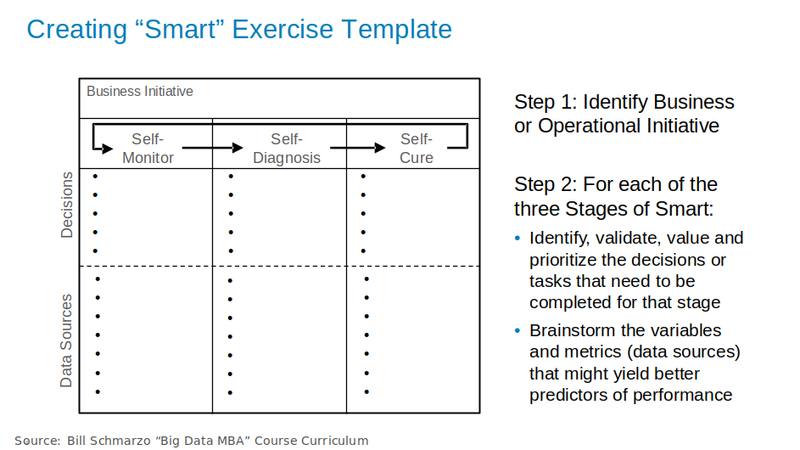 The first step in “Getting Smart” involves identifying, validating, vetting, valuing and prioritizing the decisions1 (or use cases) that the smart entity or product needs to make in support of its operational goals. 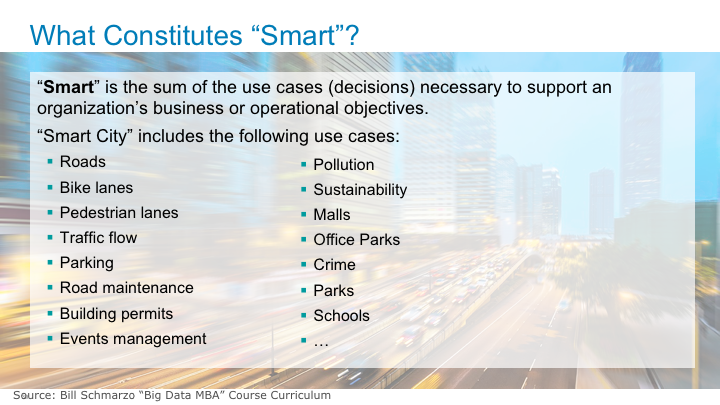 For example, a “smart” city initiative would need to optimize decisions around traffic congestion, local events, crime, safety, road maintenance, building permits and more (see Figure 1). 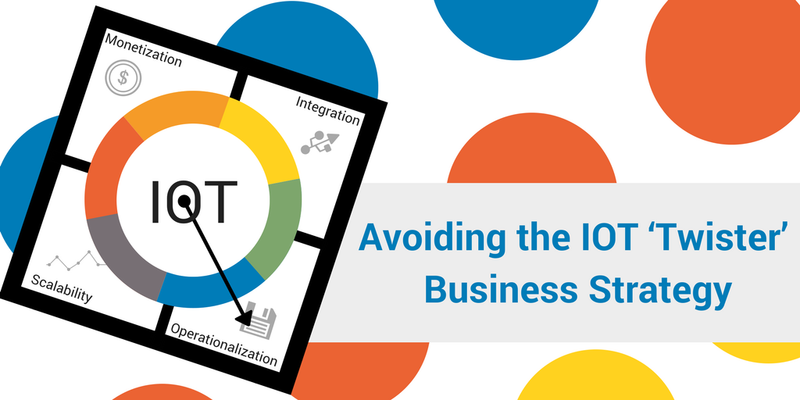 See the blog “The #1 IOT Challenge: Use Case Identification, Validation and Prioritization” for more details on how to identify, validate, value and prioritize your use cases. While there are many decisions that city management and planning must make to create a smart city, the list is not infinite. And it’s important to note that not all decisions are of equal value, which is why you’ll want to assemble the key constituents in a workshop to prioritize the decisions (use cases) on the basis of financial and operational value vis-à-vis implementation feasibility within some agreed upon timeframe (see Figure 2). Drive organizational consensus on the initial steps and the process going forward. Capture comments on the drivers of business value and the impediments to success. 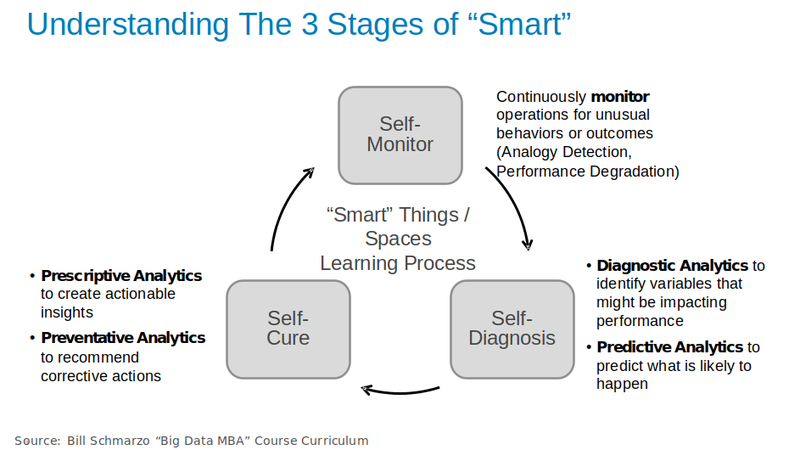 By the way, capturing the “Getting Smart” requirements is not a “show up and throw up” exercise. Detailing the business and operational requirements is critical to your “smart” entity success which includes quantifying the financial ramifications (costs and benefits), identifying the measures or KPI’s against which progress and ultimately success will be measured, and calculating the financial and operational implications of false positives and false negatives. This upfront requirement gathering process is necessary to gaining organizational alignment, consensus and adoption of the decisions/use case roadmap is critical to the success of the endeavor. The organization should NOT proceed unless everyone has bought into and committed to the plan forward, including enlisting the support of the rank-and-file workers who are the ones who actually do the work. 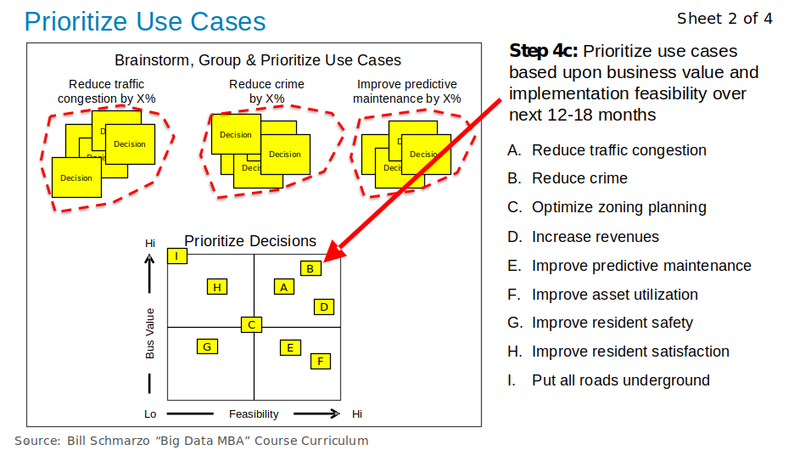 Note: if the build out of use cases is approached in a coordinated fashion, the data and analytics developed for the first few use cases can be re-used for subsequent use cases, which not only accelerates the development of future use cases, but also continuously improves the predictive accuracy of existing use cases. Second, we need to identify the data and analytics requirements necessary to create a “smart” entity that self-monitors, self-diagnoses and self-cures. This is the heart of smart; to create a product or space that is self-aware in its ability to optimize and learn from each interaction and transaction (see Figure 3). We have created a workshop exercise and template for my University of San Francisco class to help our students understand how to go about creating a smart product or space (see Figure 4). Organizations then want to identify where and how to integrate the customer, product, service and operational insights teased out of the organization’s data sources to re-engineer, or digitalize, the organization’s key business and operational processes. I wanted to include a case study in this blog, but my advisors said that at 6 pages, this blog was already too long. So that case study will have to wait until my next blog, and heck, that even gives me a chance to assign homework then! Organizations are facing a business model disruption like they have never experienced before, fueled by rapid advances in sensor technologies, an out of control avalanche of sensor data and the rapid democratization of advanced machine learning, deep learning and artificial intelligence capabilities. These are truly “weapons of business model mass destruction”. 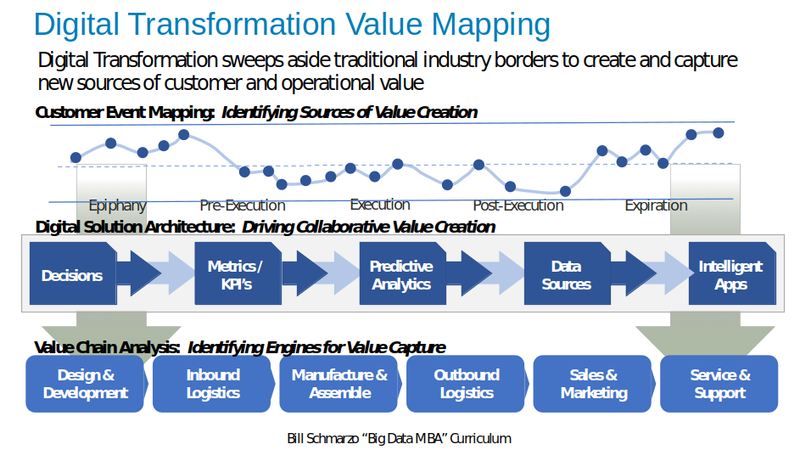 To avoid the IoT ‘Twister’ game and avoid becoming a victim of these “weapons of business model mass destruction”, one needs a coherent, coordinated plan for identifying the sources of customer and market value creation and capturing those sources of value. And more and more, those sources of customer and market value creation will be delivered via smart product and spaces that leverage these IoT and advanced analytic capabilities to create products and environments that self-monitor, self-diagnose, self-cure and continuously learn across every step in the process. For purposes of my papers and workshops, I define “use cases” as a cluster of decisions around a common subject area such as improving customer retention, reducing hospital readmissions or reducing unplanned operational downtime.